I love the fact that when my friends see cool stuff on the side of the road they immediately think to call me. 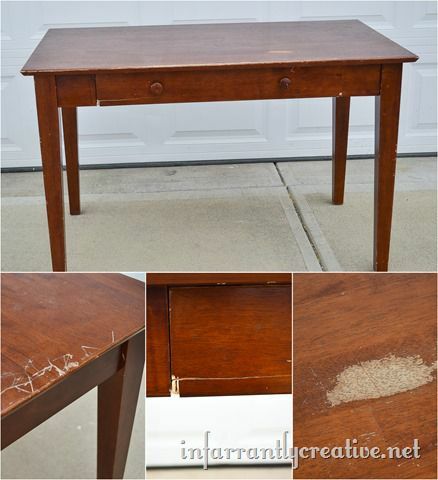 My friend Jenn told me about a solid wood computer desk that she drove past when she was dropping her son off at school. I immediately drove to the next subdivision over and scooped it up. It was heavy as all get out – I really don’t know how I heave-hoed it into my van. When there is a will, there is a way right? Here it is in its frozen state sitting in the snow waiting for it’s demise. It was definitely in need of some work. But solid wood pieces get me every time. It sat in my garage for about 6 months before I decided to turn it into a coffee table for my friend. The drawer pulled out and laid flat for a keyboard. My friend Rex from Carpentry Plus came over and turned it into a regular drawer with no-drop down using a Kreg Jig and some pocket screws. He also cut down the legs for me and added trim to the front to cover up the cracked and broken piece. And then it sat in my garage for another three months. So I finally needed room in my garage pulled it out last week and got started on it. I started by stripping the top with a chemical stripper. I put a few coats on and let the stripper do the work all the while scraping it off in the direction of the wood. After it was mostly stripped off I sanded it down with 50 grit sandpaper until it was completely back to its natural wood state. Then I did a few passes with 100 grit sandpaper, 180 and 220. Then it was ready for stain. But first I painted the bottom. I decided to try my hand at the chalk paint again since I was so happy with the results of my sofa table. And I still can’t get over the two-toned look. I just love paint with the rich tones of wood, it is the best of both worlds to me. So I started by first painting the bases CeCe Caldwell’s Sante Fe Turquoise. I used really messy strokes and just covered the base. This allowed it to show some texture when I sanded through the top coat. My friend already had a light aqua paint she wanted me to use so I mixed it with some Paint Minerals. Paint Minerals is a new product put out by a local girl here in Indy. Here is the gist: she sells the minerals that you can mix in with any paint to turn it into chalk paint, gesso, impasto or gouache. Now don’t ask me what impasto or gouache is but I know what chalk paint and gesso is. Anyway, I was immensely impressed with the product and felt like it did just as well as the CeCe Caldwell brand when it came to sanding and the texture of it. The final finish wasn’t as smooth to the touch as the CeCe brand was but that doesn’t matter too much to me. It is an awesome product since you can make any color of paint a chalk/clay paint. After it was all dry I used a sanding sponge to sand back the light aqua Paint Minerals paint to show the Cece Caldwell Sante Fe Turquoise and some of the original stained finish. You can really see the texture of the sloppy brush strokes coming through. Next I flipped the table over and gave it a coat of stain. Then I painted the knobs with an oil rubbed bronze spray paint. After everything was all dry I gave it a coat of the CeCe Caldwell clear wax which is absolutely awesome. It gives it a wonderful hand rubbed finish and just enough protection. For more information about Paint Minerals you can check out their site as well as their Etsy site. Paint Minerals is also offering all IC readers an additional 10% off with the code SAVE10. For a CeCe Caldwell Paint distributor near you you can check here. Disclaimer: While I did receive all this Ce Ce Caldwell paint/ Paint Minerals for free I was not compensated for this post in any way. Everything I say it about my experience with the product.